Singing Wilderness was written by Sigurd F. Olson. 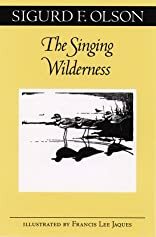 Singing Wilderness was published by Alfred A. Knopf. About Francis Lee Jaques (Illustrator) : Francis Lee Jaques is a published illustrator. A published credit of Francis Lee Jaques is The Singing Wilderness (The Fesler-Lampert Minnesota Heritage Book Series).